Issue 106 Sneak Peek | Top Crochet Patterns help us prepare for Christmas Jumper Day and we crown our toymaking champion. Check out our Christmas Crafting Guide! The latest issue of Let’s Get Crafting is certain to tickle your festive fancy. 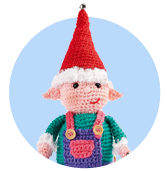 Whether you want to crochet Mrs Claus, elves and tree decs, or instead knit crackers, stars and a scarf you’ll find it’s bursting at the seams with exciting patterns. Sue Stratford discovers how the internet has changed the way we craft, Save the Children help us prepare for Christmas Jumper Day and we crown our toymaking champion. If you’ve not heard of bias knitting before it may sound complicated, however it’s actually very simple – we guide you through it inside. We can’t wait to see your finished scarf; it’s sure to brighten up winter days through to Christmas and beyond. Say hello to Roxie the Jack Russell. She loves a big cosy jumper to keep her comfy throughout the chilly weather. Sachiyo Ishii’s fun make is a quick knit that you can get started on this weekend whilst snuggled on the sofa. Mythical, magical and absolutely magnificent – we all know someone who is obsessed with the creature of the moment so it won’t be difficult to find a recipient to make this for. Sarah Louise Read’s cute unicorn is great for newbies to the crochet world. If you’re feeling adventurous, why not try personalising Snowball’s jumper with a different seasonal motif using the surface crochet method? Does it get any better than waking up on Christmas morning to a bag of goodies? If you know someone who deserves to be on the nice list, then we recommend you whip this up for them to treasure year after year. This fun design by Nicola Valiji is sure to bring a smile to any guest’s face. They’re quick and easy to make, so we recommend you cast on whilst snuggled on the sofa with a hot chocolate nearby. If you’re not so confident with your colourwork you can omit the stripes and make each sock in a different yarn from your Wonderland kit. For our showstopper decoration, Sarah-Jane Hicks has expertly married this issue’s wonderland yarns with shiny baubles in complementary colours. It’s a lesson to us all about pushing the boat out – extend your Let’s Get Crafting pack with fabric, bold embellishments, yarns from your stash and, yes, even pre-made Christmas ornaments. Who knows what winning partnership you’ll come up with? We absolutely love toymaking – if you haven’t guessed – and Heather Gibbs’ creations are always top drawer. 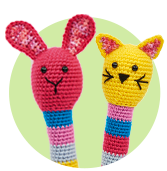 She uses basic crochet stitches to craft endearing toys that make everyone here at Let’s Get Crafting HQ say ‘aww’, and Mrs Claus is no exception. The apron, mop cap and wire specs are the perfect finishing touches – and her blue rinse is as soft as anything too. Christmas Jumper Day takes place on 14th December 2018 so if you’re short on time to craft a garment, give these a whirl instead – just add the accessories to your winter wears and you’ll be good to go! Liz Ward’s patterns are great for you crochet newbies out there, however if you fancy a challenge try using the surface crochet technique to add tinsel to the tree.